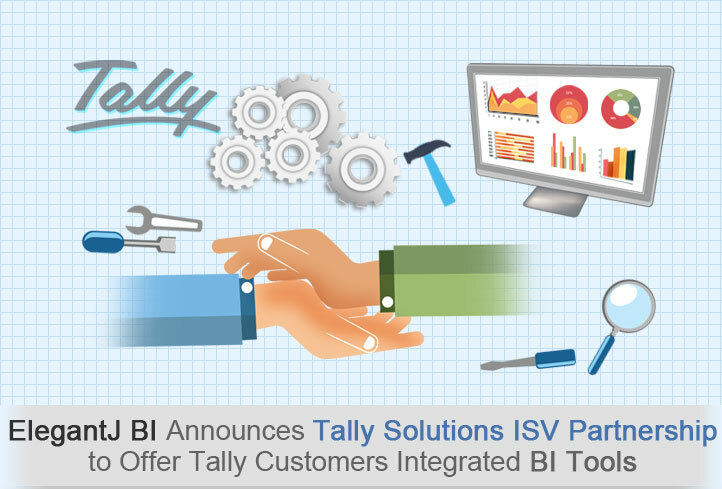 ElegantJ BI is proud to announce its ISV relationship with Tally Solutions, combining Business Intelligence with the popular Tally® accounting solution. The ElegantJ BI business intelligence Tally® partnership benefits small to medium sized enterprises (SMEs), by supporting their ongoing usage of the popular Tally® ERP and accounting solution, and helping Tally customers to leverage the value of Tally in an integrated, scalable environment that supports company and user base growth, and enables true self-serve business intelligence reporting and in-depth analysis. Many businesses are already enjoying the benefits of the ElegantJ BI/Tally partnership, including a Hyundai Automobile dealer using this integrated approach to achieve a clear picture of multiple warehouses, showrooms, and service centers with integration of Tally with their dealer management system and a large conglomerate using the Tally/ElegantJ BI integration to consolidate and analyze data from more than twenty-five (25) affiliated group of companies. “The ElegantJ BI, Tally® relationship has evolved over time,” says Patel. “Our team works with the Tally Solutions to support Tally customers and provide a comprehensive, stable environment in which customers can leverage the familiar tools provided by Tally as well as our simple, affordable, mobile BI tools“. Business users love the Tally® solutions, and power of ad hoc data mining and visualization can help businesses to take them to the next level. Business reporting needs are ever-changing and never-ending, and the need for ad hoc data mining and visualization is crucial. Executives need to monitor summary results and key performance indicators (KPIs), while sales managers may need information on weekly sales, targets, and receivables. With ElegantJ BI and Tally, businesses can better leverage their accounting solution and gather and analyze business intelligence data from multiple sources. Tally Solution partners can also benefit from a relationship with ElegantJ BI and its innovative, mobile BI tools and solutions. ElegantJ BI invites Tally partners to explore a relationship with ElegantJ BI and find out more about its partnership program. ElegantJ BI is a flagship BI solution by Elegant MicroWeb, powered by unique Managed Memory Computing technology. This independent product suite analyzes data from any transaction system. It is used by large, medium and small businesses around the world, including Saudi Telecom, IPCA Laboratories, JMC Projects, Sharekhan, Raychem RPG and many other small and medium size businesses.